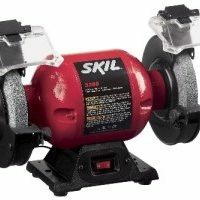 If you’re a DIY lover or you simply like to keep your tools in good condition, a bench grinder is the tool you simply must have. It keeps the cutting blades sharp, which makes your DIY projects safer, faster and easier. Without a bench grinder, you need to buy new tools every time the old ones get dull. 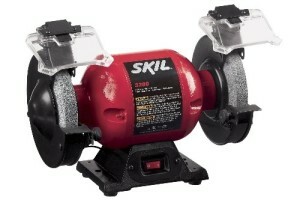 Therefore, for everyone who regularly does DIY projects, buying a bench grinder is a wise investment. Bench grinders, no matter if it’s variable speed bench grinder or another grinder types, can be used with different wheel types, depending on your grinding need. A rough stone wheel is used for smoothing out the edges of screwdrivers and similar repair work. A fine stone wheel flattens out a chisel, while a wire feel can be used for cleaning rust off tools before sharpening them. Use a buffing wheel to polish tools. When picking a wheel type, make sure you choose the one that’s designed for the job you’ll be doing most frequently. Also, check whether it’s rated for the speed of your own bench grinder. This is very important, because using a wheel on a faster setting that it’s able to handle could lead to its explosion. Of course, that can happen even if you’re doing everything right, but it happens more often if wheels and grinders don’t match each other. Any wheel needs TLC from time to time if you want it to do its sharpening job appropriately. Keep it clean and test it for cracks on a regular basis. In theory, you could use the wheel until it wears down to the label. Nevertheless, it’s highly recommended to replace it once it becomes too small to be used with the tool rest. Each time you use a bench grinder, in order to prevent building up of the heat on the tip of tool being ground, move the tool back and forth across the wheel. Keep in mind that any bench grinder can emit sparks; thus, it’s crucial to wear safety glasses and gloves when using it. Of course, you should always use the bench grinder’s own safety shields.